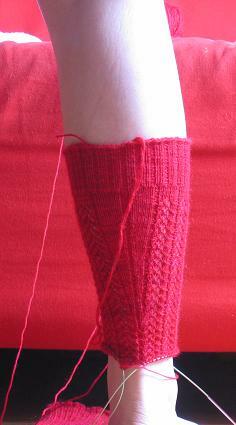 Pic of the back stockinette panel on the "evening stockings for a young lady" from "Knitting Vintage Socks." Color is a bit off b/c of my super white calf and super red couch, but you get the idea of the panel... how the panel decreases on down to nothing, after starting @ the widest part of my calf. I was thinking, if you wanted to make the socks longer, you could just follow the written directions but keep the panel undecreased until just where the calf is at its widest point (as it is here) and then continue. It would look more like a spear tip instead of a "V", though. Like I said, these aren't really knee highs but super long socks, but I do like them a lot :) And the word super, apparently!! I also meant to ask if anyone knows, how I can respond to questions in comments via email? Or do you think its better to do it in subsequent posts? I always mean to via email, but when I check my comment email blogger never gives me return addresses of those who use blogger (weird, eh) and by the time I think to write back I forget... (something to do with the fact babybear gives me about a barney episode's length of computer time a day!) ;) I do really appreciate all of the kind words and hints yall send me thru the comments. Rachel asked if I needed to rinse the dyed yarn in vinegar, or washed any easter egg dyed yarn yet? ... I didn't have much experience with the easter egg dyes other than my previous attempt, so my methods are kinda fly by the seat of my pants. I used vinegar to the dye (actually dissolved the dye in vinegar), and also soaked the yarn pre dying in some warm water with vinegar, but I didn't rinse it in vinegar to set it. I actually rinsed the dyed yarn before putting it to steam set, and didn't have any bleed that i could tell. I think the superwash yarn is just very thirsty for the dye; all of the containers of dye were exausted into the yarn-- leaving only clearish-water, and I really wasn't worried it wasn't set as there was no leeching of dye or bleeding in the quick rinse before steaming or the good wash I gave it after it came from the steamer. Jennyraye wanted to know how I skeined the yarn for dying... Its mindnumbing, but I placed 2 chairs 330" apart (actually, 300" apart, as the chair backs are 15" across apiece), tied the starter end of the yarn (wound into a ball to help prevent tangling) to a chair back, and walked back and forth winding the yarn in a super long hank that you can see in here. It took forever! :) And forever and a day to wind it into a smaller skein when it was dyed! After the undyed yarn was wound into the long hank, I measured off 220" sections and marked them with easily removable waste yarn... (I also tied the yarn in places to prevent knotting of the skein-- very easy to do with this length-- using a different color waste yarn than the one I used to make off the 220" sections). I then "gathered" the 220" sections together (in half) and tied them at the demarcation yarns, so I had 3 110" lengths (the 220" was doubled over) to dye. It kinda looked like a banana peel, 3 long sections connected by a nexus. I immersed the sections in the dye mix-- dye, vinegar & hot water (using either pyrex glass casserole or clear glass mason jars; "painting" or squirting the yarn isn't really an option in my tiny kitchen) and let the dye exaust in the long sections of yarn. I then rinsed, steam set, and rinsed/washed the yarn... wound it in as loose a formation I could across a wide plastic hanger (there's no way I could let it dry in the long hank across 2 chairs, kiddo would... well, yeah. not possible.) I let it drip dry (another plus for superwash, I could squeeze the excess water out of the long ends of the yarn where it would accumulate, to help it dry more quickly) til it was pretty dry. I then moved the yarn in front of a small fan and let the air circulation take care of the rest-- it was dry by the time I woke up in the morning. And Elspeth is right, no one has guessed my knit picks order for the contest yet :) I think random.org is going to be picking our winner! (edit... Rachel is a super genius (see comments). in order to email commenters back via email, on blogger, they have to have the "show email address" box checked on their blogger profile. at least i know its possible and i'm not nuts... everyone should enable their email address to be shown, just for sanity's sake :)...) happy weekend x 2 !! If you figure out the comment issue, please let me know! I've been wondering the same thing! Thanks for answering my question about the dyes! Ha! Rachel is a genius. In blogger, you have to have "show email adderss" checked in your profile; it will show up on your profile, but it will also enable your email address to be shown if the blogger has their comments emailed to them. I agree! Please enable the email in your profile--I love responding to comments by email. It's so much more personal! Interesting -- I had no idea that having your email visible would help. I tried Haloscan which is nice, but since it opens up Outlook and I can't seem to get that set up, it's not entirely helpful. But I do get email addresses that I just type into gmail. That sock looks great - very, very cool. The back panel looks great! I can see how you might be dubious about it beforehand, but it looks really nice on. I wasn't envisioning it tapering like that. I am glad you are spreading the word about enabling the email in your blogger profile. It's so much more fun to be able to respond to one's comments. The back of your sock looks really pretty. Is this sock from Vintage Socks? 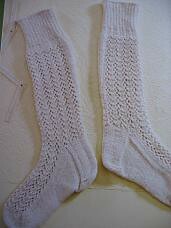 I am thinking of ordering myself a sock book and I think Vintage Socks is the one I am going to get. Thanks for the links for the warping boards - I'll have to try that with my cone of HA. The socks look great - I love the V panel in the back!